Young corn plants hit hard when the weather gets sweltering. Farmers know something is up when they see three-digit temps in May, and it turns out their corn plants might too. Dry conditions and record-setting heat are stressing young, Midwestern corn plants, according to Purdue Extension Agronomist Bob Nielsen. According to the latest U.S. Drought Monitor, Nielsen, points to Indiana and Ohio, which are both experiencing abnormally dry weather. Both are also experiencing high temperatures too. The combination is not good for young corn plants, which need enough soil moisture to develop their root systems. "The success or failure of the initial development of a corn plant's nodal, or permanent, root system greatly influences the success or failure of the young corn plant in transition from 'life support,' using kernel reserves to relying on the development nodal root system," Nielsen says. That transition starts at about V3, or when corn has three visible leaf collars. And according to Nielsen, corn younger than V3 can look healthy and uniform because it is still relying on kernel reserves. However, if stresses stunt development of permanent roots, plants won't be able to make the transition to relying on a fully developed root system. "The concern raised by farmers about the recent unusually warm temperatures and the forecast for more of the same is a valid one given the current stage of development of much of the state's corn crop," Nielsen said. "Approximately 76 percent of the crop is currently at growth stage V5 (leaf development) or younger. Maybe one-third or more is at V3 or younger. 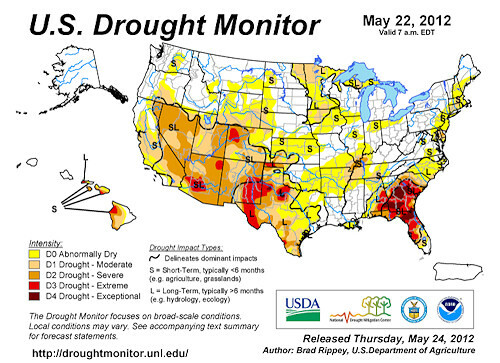 ADVANCING DRY: Latest Drought Monitor map offers little good news for parts of the Corn Belt. "Concerns over hot and dry weather right now are similarly valid, given that many fields have not yet successfully developed their initial set of nodal roots."